Restless legs syndrome is a common sensorimotor disorder characterizated by abnormal sensations that occur primarily at rest or during sleep, which are alleviated by movement of the affected limb. The impact of RLS can be severe, with adverse effects on sleep, cognitive function, mood and quality of life. Several studies in Europe have found prevalence of 5-10% in adults, with about one third affected to a moderate or severe degree. Two forms of RLS have been identified: primary and secondary. The primary form has a strong familial inheritable component and symptoms typically worsen with onset young adulthood. Secondary RLS has been described in adults with renal failure, pregnancy and iron deficiency: RLS starts after the onset of these conditions and commonly resolves when the condition is corrected. For example, end stage renal disease produces neuropathy but that neuropathy changes little with successful kidney transplant, yet the RLS usually disappears. There are two major putative causes of RLS, CNS dopaminergic abnormality and CNS iron insufficiency, but a lot of studies remark the role of iron insufficiency as the key of this pathology: the reduced CNS iron status produces RLS symptoms largely trough its effects on the dopaminergic system. Furthermore, the complex nature of RLS as a somatosensory network disorder suggests that several levels of interaction occur between central and peripheral circuits in parallel, many of which may be amenable to modulation by dopamine and iron levels. 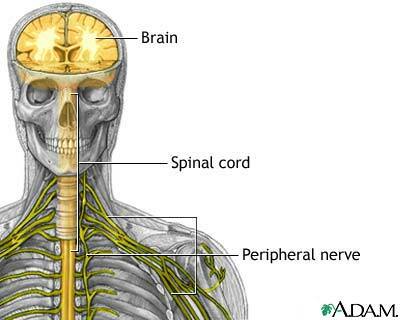 MAIN ARTICLE The spinal cord is the part of CNS that provides the gateway for information transfer between body and brain. It is also an integrative center of neuronal circuits that coordinate complex sensory, motor and autonomic functions. Spinal cord function is strongly modulated by serotonin, norepinephrine and dopamine. Dopamine is a neurotransmitter that binds to D1-like receptors coupled to the G protein Gs to stimulate adenylyl cyclase and formation of cyclic adenosine monophosphate (c AMP), leading to a facilitation of network excitability. It also binds to D2-like receptors coupled to G1 to inhibit adenylyl cyclase and cAMP production, generally depressing network function. Dopamine appears to have lower affinity for the D1-like receptors compared with the D2-like receptors. A small cluster of dopaminergic neurons (A11 population) found in the dorsal-posterior hypothalamus is thought to represent the sole source of spinal dopamine in the rat and the mouse. Dysfunction of the A11 region has been implicated in the pathophysiology of RLS: in RLS the circadian cycling of dopamine, that reaches its lowest levels in very early morning, is either excessively lowered or has a blunted reduction. If there is low dopamine release, it has inhibitory actions that would normally activate high-affinity D2-like receptors to reduce sensory responsiveness. The consequence of a hyporelease of dopamine then has been hypothesized to lead to a series of parallel events that disinhibit spinal cord sensory, motor and autonomic systems. An alternate hypothesis is that the principal pathophysiology in RLS resides in a hyperfunctioning of the A11 dopaminergic pathways at nighttime. This could result in an aberrant activation of lower affinity,but “excitatory” drive mediated by D1 receptors, even when low levels of the receptors are present. Indeed, there is evidence of an altered circadian rhythmicity in dopamine metabolism in RLS. Further studies are warranted to confirm these hypotheses in humans. The literature indicates a close relationship between brain iron status and the dopaminergic system. art.3 A lot of studies conducted on brains obtained at autopsy from individuals with RLS have been demonstrated a reduction of D2 receptors in the putamen and substantia nigra in association with iron deficiency and a relationship between D2 expression and RLS severity. There is a strong inverse correlation between these two terms. The abnormal reduction in D2R occurs especially for patients with severe RLS: this supports the clinical evidence that alteration in the dopaminergic system may underline the symptoms associated with RLS. The major secondary causes of RLS share at least one common problem: they all compromise iron sufficiency and in each case when the condition is corrected, the iron problem is also corrected with clinical remission of RLS symptoms. So all conditions that compromise iron availability will increase the risk of RLS leading to a higher then expected prevalence of RLS in these conditions. Increasing the body iron stores in patients with RLS and ID can provide relief from all RLS symptoms in some patients, particularly for those with lower ferritin levels. Brain iron concentrations differ dramatically both by areas of the brain and with normal aging. The putative iron-dopamine connection focuses interest on the dopamine producing areas with high iron concentration and particularly the substantia nigra. If altered iron status produces the RLS symptoms, how does reduced iron change the dopaminergic system? The iron-dopamine relation can be studied in vivo using dietary induced ID in animal models. The iron concentration decreases varied between brain regions. The iron decreased by 60% in the ventral midbrain, in 30% in the caudate-putamen and 20% in the nucleus accumbens. ID lead to a decrease in striatal D2 receptor. The D2 receptor density correlated positively with striatal iron. Furthermore these studies indicate that ID increases striatal extracellular dopamine enhancing the amplitude of the normal circadian pattern. The reduced D2R would reduce the information provided to the presynaptic cell regarding extracellular dopamine levels. than iron insufficiency might produce dopaminergic or other abnormalities that could produce RLS symptoms. Theories abound, but there are only meager data showing actual clinical relations of factors other than iron and dopamine to the occurrence of RLS symptoms. Some data indicate that RLS occurs more with the use of SSRIs, with some forms of neuropathy and possibly with rheumatoid more than osteoarthritis arthritis. However, even rheumatoid arthritis involves problems with iron management and the relation to RLS may be secondary to this iron problem. Whether or not the other conditions associated with RLS involve iron problems or interact with iron status of the patient has not been evaluated. It, however, seems likely that RLS will have multiple determinants some of which may not involve iron at all. That iron insufficiency probably does not cause all of RLS does not reduce its importance as one major cause of RLS that provides us with basic information about RLS pathology. It may also interact with these other determinants of RLS. differentially affect diverse parts of the brain consistent with evidence for RLS pathology in several brain areas including the tuberoinfundibular, A11-spinal, thalamic, and nigrostriatal systems. These important studies serve to confirm the role of iron and indicate biological bases and targets for treatment.